At a meeting in San Francisco last night, Facebook’s head of media and content partnerships announced its new Facebook + Media page, a crib sheet. At a meeting in San Francisco last night, Facebook’s head of media and content partnerships announced its new Facebook + Media page, a crib sheet for old media firms to best use Facebook’s half-a-billion-users clout to spread their content throughout the connected world. Obviously, this is something that Google and Twitter already do, so the news can be read in two ways: Either it’s Facebook sticking its size elevens on Google and Twitter’s territory and claiming a slice of the market, or it’s a mammoth PR job–it is the summer, after all. 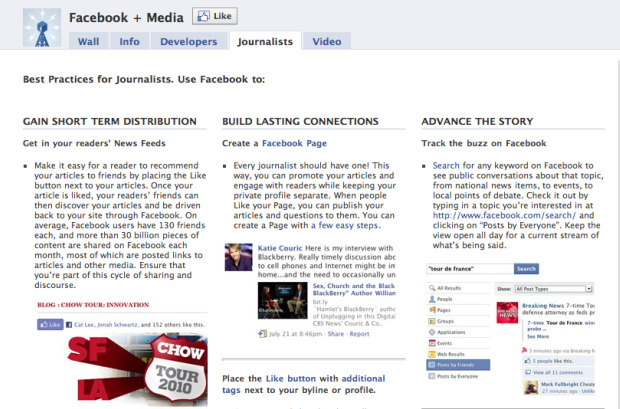 Justin Osofsky posted an entry on the Facebook developers’ blog entitled “Working with Media Organizations to Build Social News.” In it, he talks about how the Like button can increase a website’s pageviews by up to five times, and plugs some of Facebook’s features, such as its Activity Feed, Recommendations, Live Stream, and the search API. Basically, it’s known as sprinkling a little Facebook magic on those slightly more mortal sites. Just in case the new-media managers of the old-media sites don’t get it, there’s even a Facebook + Media page that spells it out in words of less than 101,101 syllables. It’s a given that Web-savvy media firms such as Fast Company have had a Facebook presence for ages, while staider publications aimed at an older readership are learning to ride the Facebook horse without too many problems. But publications are inherent communicators–we’re not firms like Nestle, which need a lot of hand-holding when they start out in social media. Facebook’s positioning in this market is understandable–after all, it sees itself as the heir to Google’s crown, and is pushing hard to topple the monarch. If not a content-generation service, Facebook sees itself as a digital content generation assistant. But both Twitter and Google have the edge on Facebook for one reason: the privacy issue. Unlike Twitter and Google, both of which act like an open-source news feed, Facebook’s system is very closed, which means it can’t work in the same way. Perhaps if Mark Zuckerberg hadn’t been so blithely unconcerned about its users’ settings before the rising tide of public opinion forced it to make changes to its privacy buttons, then the site might still be a little more open, meaning that Google and Twitter would currently be holed up in their respective boardrooms working out their next move. But now? Not so much.